In our first segment, Becky meets a hick and Matthew accidentally asks out someone on a date. Not at the same time. 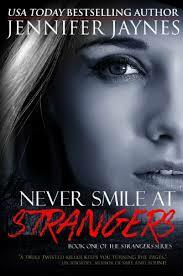 In our book this week, Never Smile at Strangers by Jennifer Jaynes, some girls go missing in the town of Grand Trespass, Louisiana. All signs point to the murderer being a stray cat named Ian. Next time: Cat’s Lair (Leopard series Book 7) by Christine Feehan. This entry was posted in Uncategorized on July 28, 2015 by Becky Selengut.